When you upgrade your phone and ask the rep to move all of your contacts to the new device, the rep uses the Cellebrite machine to make the transfer. 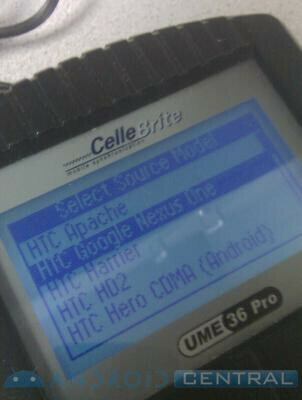 When a handset is first listed on the machine, it often is a good bet that the release of the device is imminent. We don't want to add fuel to the fire, but we need to let those Verizon customers who have passed over the Motorola DROID know that the Big Red variant of the Nexus One is now listed on the CelleBrite machine. Sure, it doesn't give us a launch date or pricing info, but it does tell us that your wait might soon finally be over. And while there seems to have been some complaints about Google's superphone in regards to finish and screen quality, sound and battery life, the N-One is still being heavily anticipated by a large number of Verizon's smartphone users. The carrier seems to be hedging its bets, though, and as we reported, recently added two fresh new commercials for the DROID along with a new tagline. Way to post everything Phonearena. If this is the case we have had the iphone for years!!! Think about what you post! another stupid phone arena post... it could easily be tmobile we are seeing.. since it has the htc hd2 in it and htc harrier the cellebrite is used by all carriers so this is a FAIL now if it had verizon on the cellulite machine I could believe it more..
the htc harrier was a sprint/verizon phone, not a t-mo phone. nice try though. and it wouldn't say verizon on the screen, it would just say CDMA (like the CDMA hero that is listed on the same screenshot. It says source, so sure Verizon can copy contacts from a Nexus One, but it doesn't show the Nexus One as the phone the contacts are being transfered to. At least the article isn't about Apple, we can all be happy for that at least. and why is it they report nexus one for verzion coming soon sprint verzion gonna be EXCATLY the same minus the branding and a few programs you know sprint gotta put on the nascar garbage. This doesn't mean anything. Working at a Verizon store I can tell ya, we have tons of phones in Cellebrite that we don't carry for the sole purpose of being able to transfer contacts for people porting in VZW from other carriers. This is really no bit of proof at all. The cellbrite machine isnt a Verizon product. The iPhone has been in the cellbrite machine since the 1st gen. and Verizon hasnt seen that phone yet. Why would this be any different? This is not a "sign" that the Nexus One is close. Its just preparation for those who possibly may be switching from the N1.